Just a brief editorial post from down here on the south coast and firstly to apologise for recent posts not being up to their usual standard. However, I have been able to post some reports from here with the help of the facilities of Worthing Library. Many of the observant among you will have noticed that this week's Throw Back Thursday appeared a day early! The post was prepared before I left home last week and mistakenly scheduled to appear on Wednesday instead of the intended Thursday - apologies for this and hope it didn't spoil your enjoyment. On the positive side, another celebration, for the second consecutive month we have achieved the highest number of monthly page views. Thank you all for your continued support. A quick visit to Brighton on Tuesday but, as you would expect, a little time for some observation and photos! 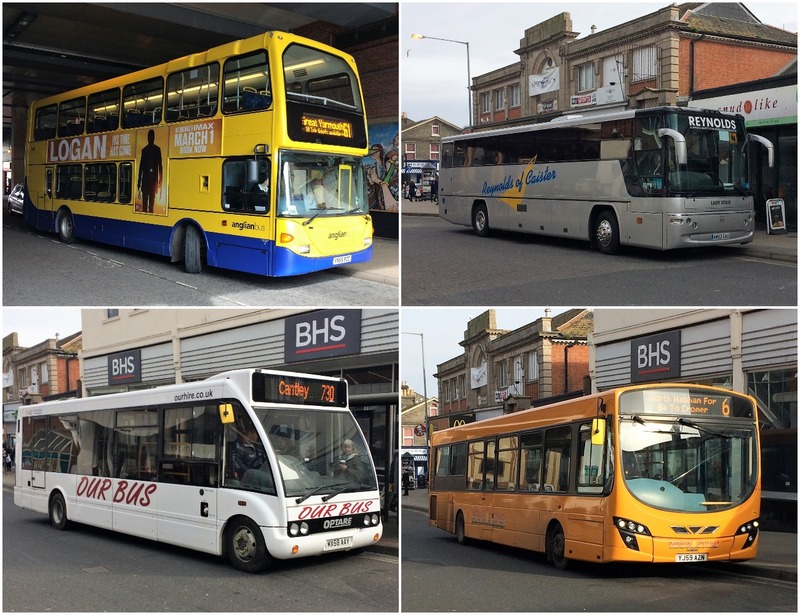 The first shows one of the slowly declining numbers of bendy buses in use in our cities and towns these days. This is Brighton & Hove's Mercedes Benz Citaro 126 BL57OXP on the 25X Sussex University Limited Stop service. 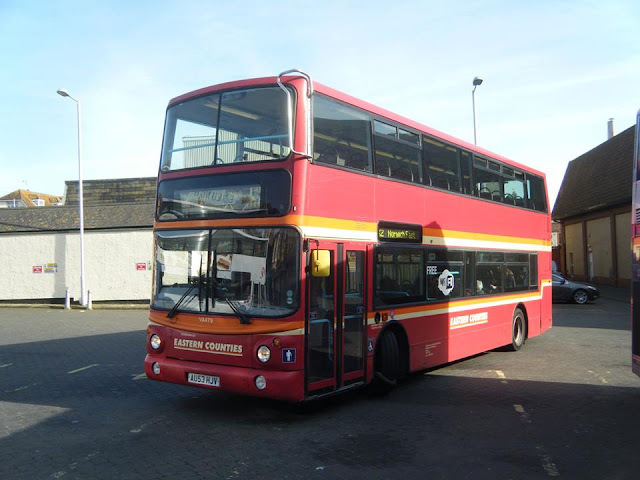 New to London General, it has also seen use in Newcastle and Plymouth. 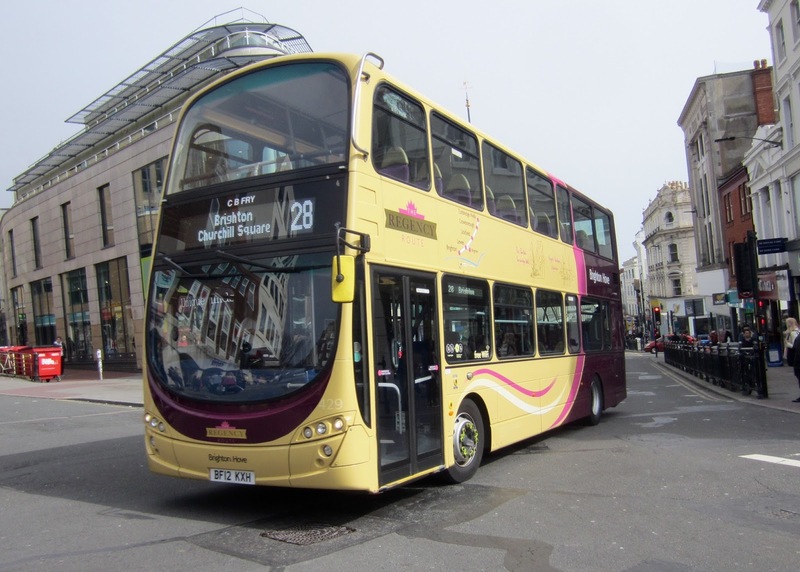 Next up is Brighton's Volvo B9TL/Gemini 429 BF12KXH which is especially liveried for the Regency Route between Tunbridge Wells and Brighton. Then there is the Brighton to Eastbourne Coaster service operated by the Wright Streetdecks and this is 927 BX15ONB nearing the end of its journey at Churchill Square. 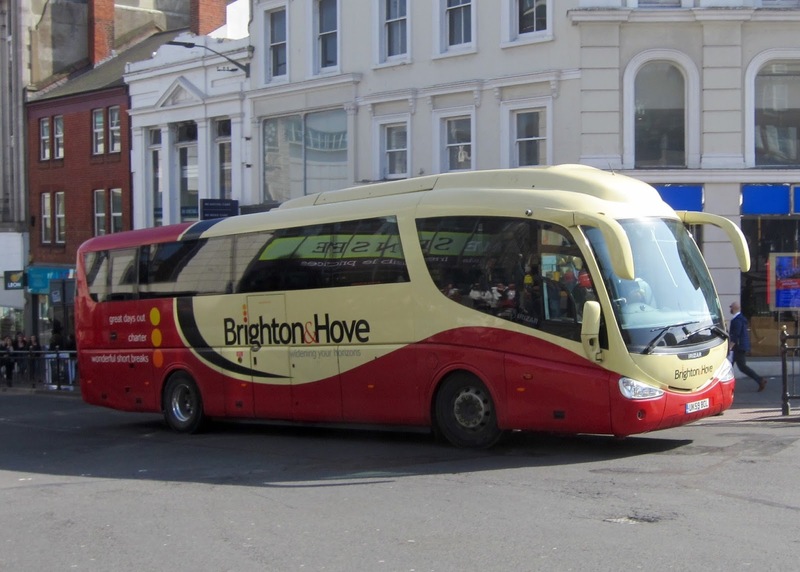 Also out in the sunshine was Brighton & Hove's Scania K340EB4/ Irizar 49 seat coach 505 UK59BCL - a sight not that often seen in Churchill Square. 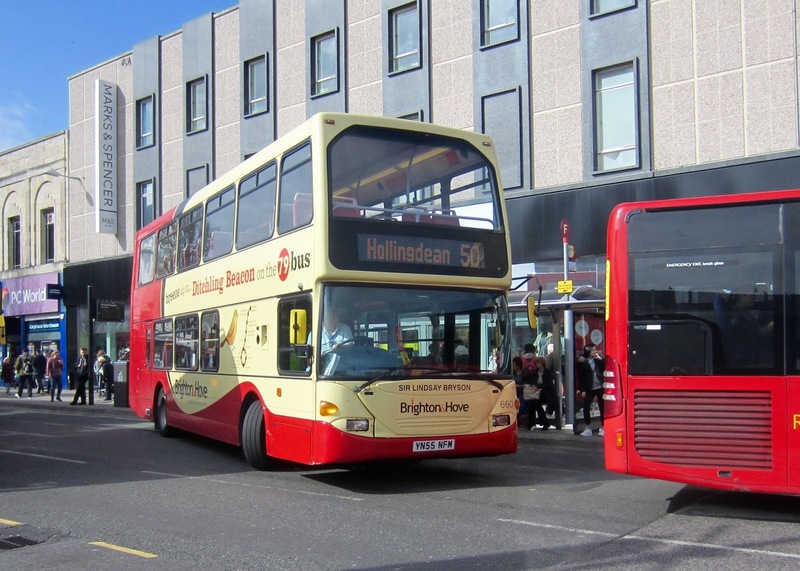 One of the Brighton routes I was interested in was the 50, which I was led to believe was where a demonstrator was reported to in use. 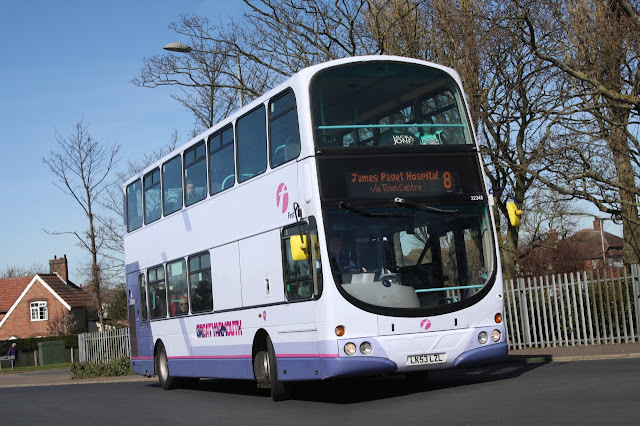 Alas I saw nothing of it but saw 79 route branded East Lancs bodied Scania 660 YN55NFM in use instead. 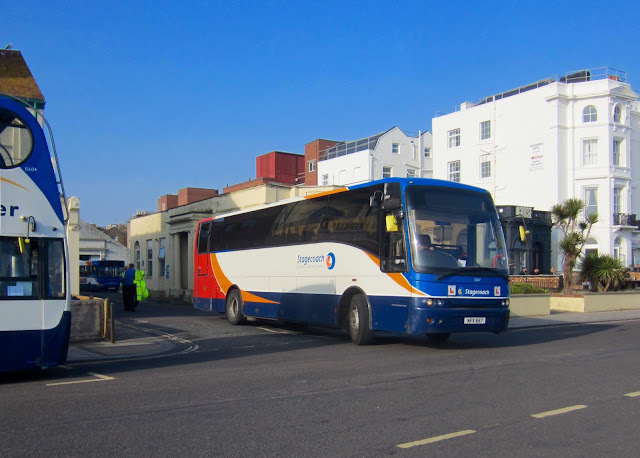 Finally, another bus out of its normal environment was Worthing's Pulse liveried Stagecoach South Enviro300 27678 GX60PDV on the 17 service to Horsham. 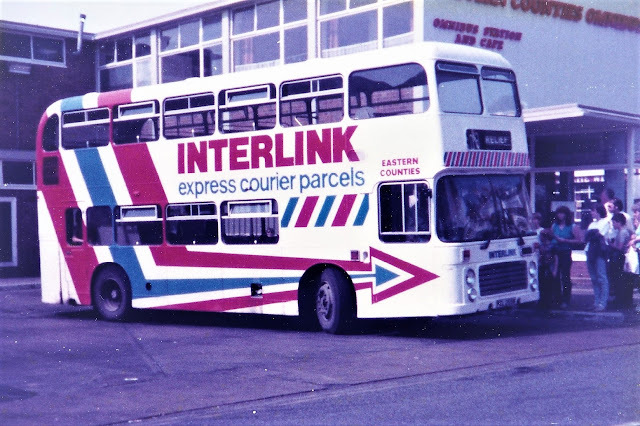 Eastern Counties PCL255W was adorned in Interlink all over livery when seen in the mid 1980s but it was new to the company in September 1980. After refurbishment in Norwich during late 1997, VR255 remained in service until March 2001 when it was disposed of to dealer Ben Jordan for scrap. According to Rob Sly's illustrated vehicle history, it had been broken up by April the following year. 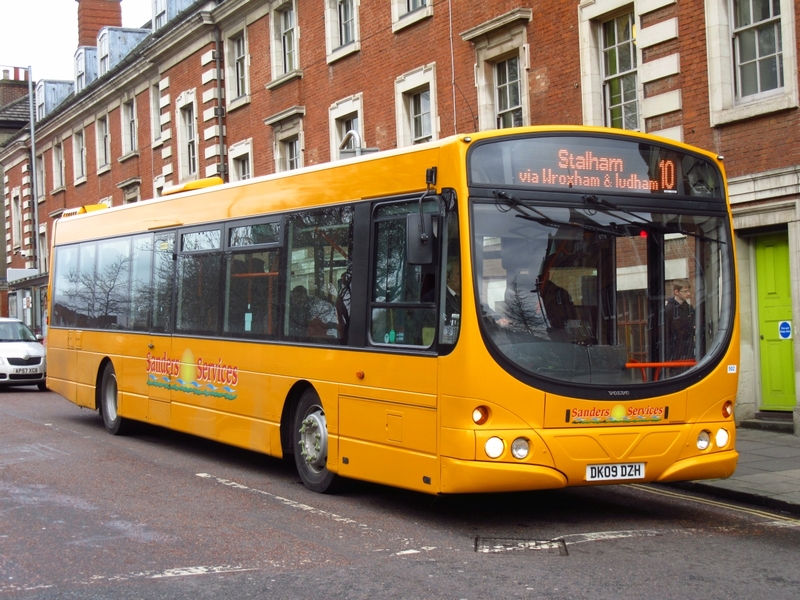 Today's Notice and Proceedings Report, published by the East of England Traffic Commissioner, reveals the following changes to bus services in our local area. First Eastern Counties is to introduce a new 40/41/X41 Norwich to Bungay weekday service commencing on 14th May 2017. The operator is also to amend the route, stopping places and timetable of its 14/15/15A Wymondham to Wroxham/Blofield Heath/Lingwood route from the same date - which will see it extend to Acle. 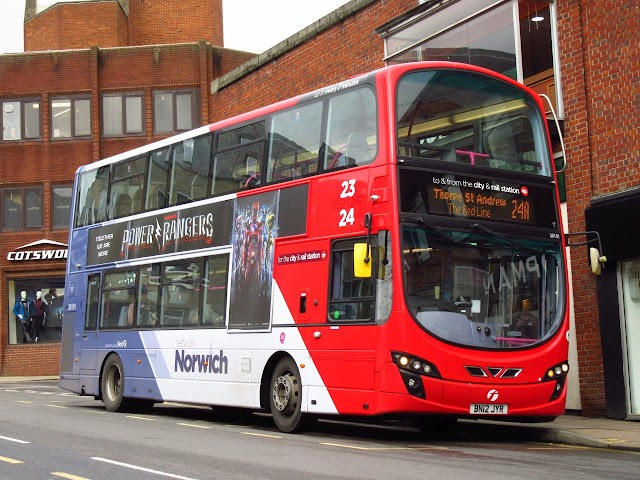 Under Short Notice, Anglianbus is to amend the route and timetable of its 88/X88 /BH272 service operating between Halesworth and Southwold from 18th April 2017. Amongst the early coming and goings was Metrobus Alexander Dennis Enviro200 6765 YX63ZWZ driving to the stand to begin its 23 service to Crawley. 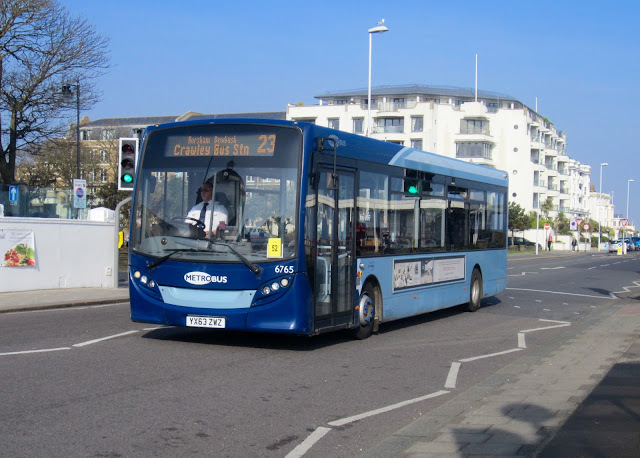 The next subject for the camera was Compass Bus Transbus Enviro300 MX55NWK not in service after completing a circuit of Steyne Gardens following its last service. After a period of just observing activity, I was caught unawares by the arrival of Stagecoach driver trainer 52617 NFX667 turning into the depot escaping the attention of my camera. However, just after I was summoned, the Jockheere Mistral bodied Volvo B10M decided to leave and I caught it on camera prior to my departure! 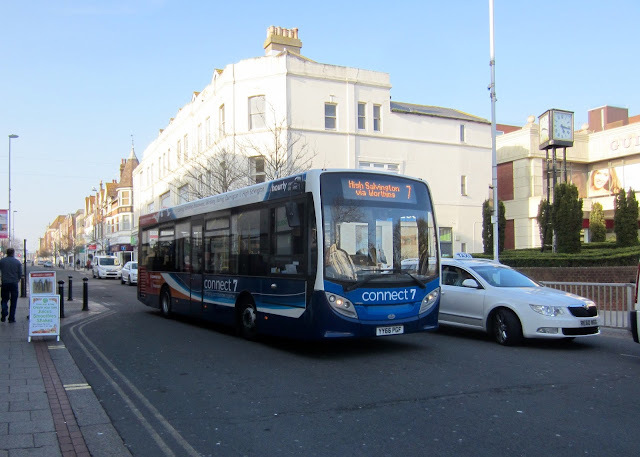 Finally, on my return I saw one of the recently delivered Stagecoach connect 7 liveried Alexander Dennis Enviro200s operated by Compass Bus. 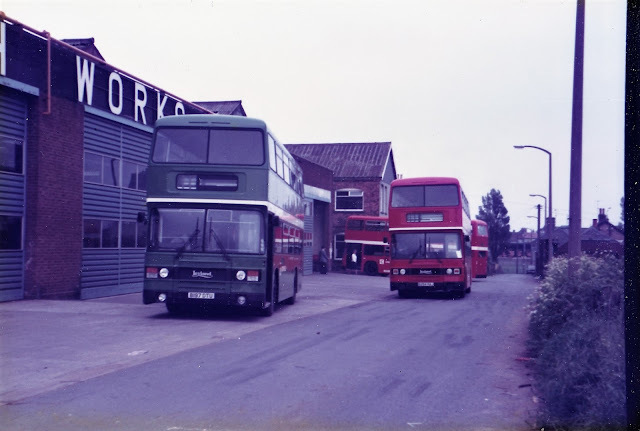 Regular contributor Roger Bellward has regularly provided photos illustrating work carried out on Norwich buses at First's Caister Road depot. A few pictures from taken on Saturday afternoon following our drive down to Worthing. The sun made for a pleasant stroll along the seafront to recharge the batteries! The first photo shows 6513 YP52CTO which is now the oldest Scania OmniCity single deck in the Metrobus fleet dating from October 2002. It was the forerunner of 79 further examples on both CN94UB and N230UB chassis. 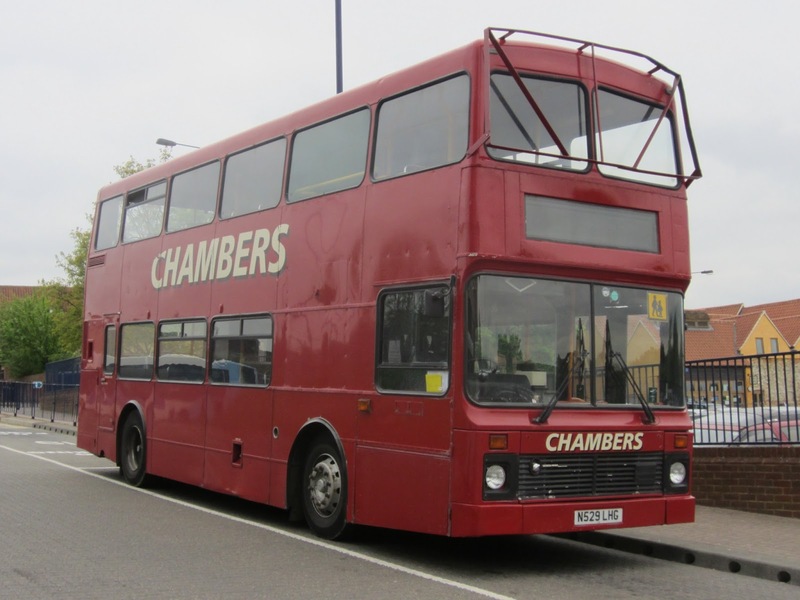 Both single and dual door bodywork styles featured in the class, though this bus has always been B-F configuration. 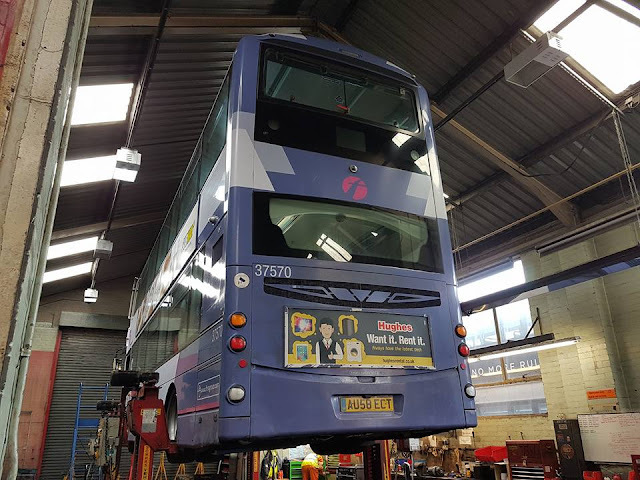 Ten of the buses were the shorter 10.9m for service in Crawley. 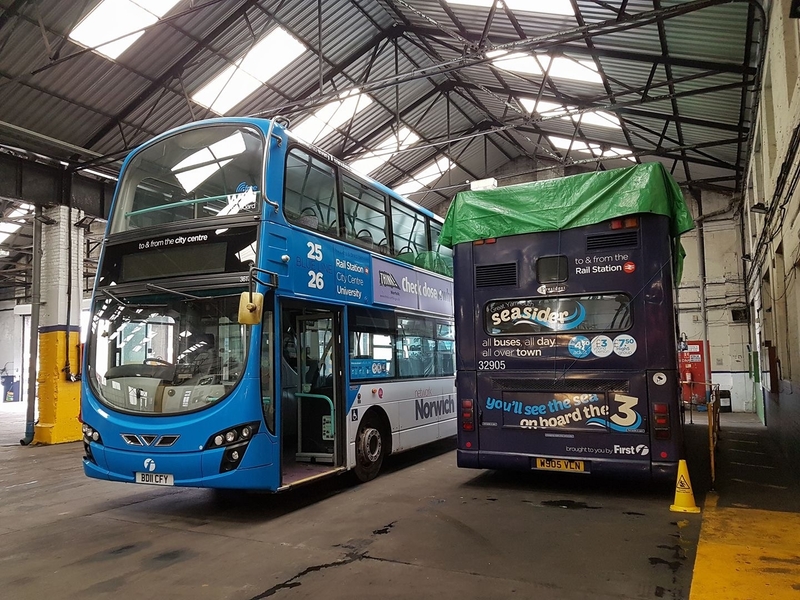 The second picture features another vehicle from the Metrobus fleet 6770 YX63ZXE, an ADL Enviro 200 also on the 23 service to Crawley. 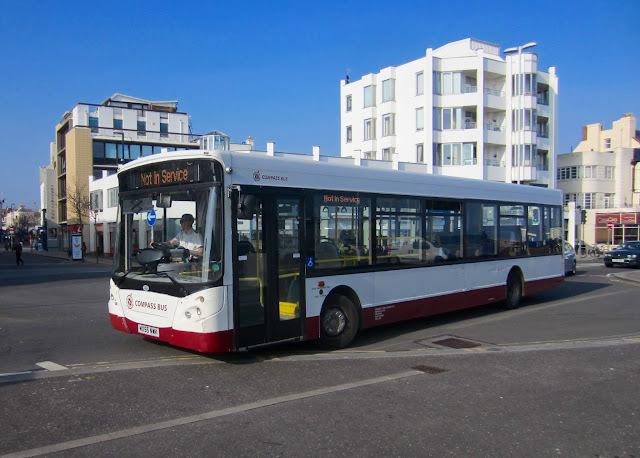 The final offering is from local independent Compass Bus which was employing YJ60KHJ on its 16 route to West Tarring via Worthing. It is shown above after passing Steyne Gardens in glorious sunshine. As Roy is away in Worthing i thought i would venture along the Seafront this morning to see if any Shearings Coaches were in town. 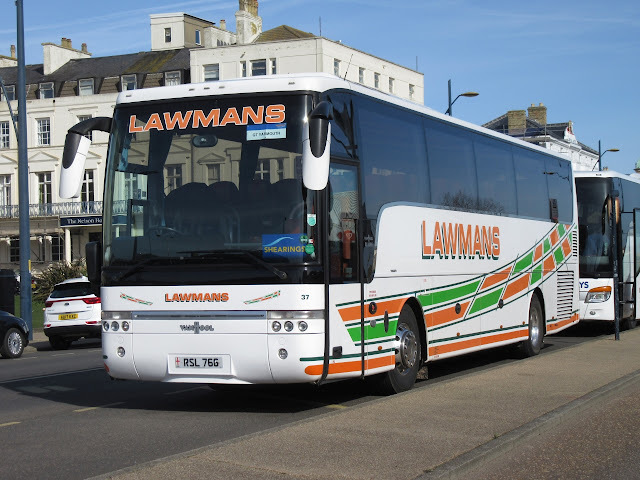 I was greeted with a stand in this morning from Lawmans Coaches of Kettering. 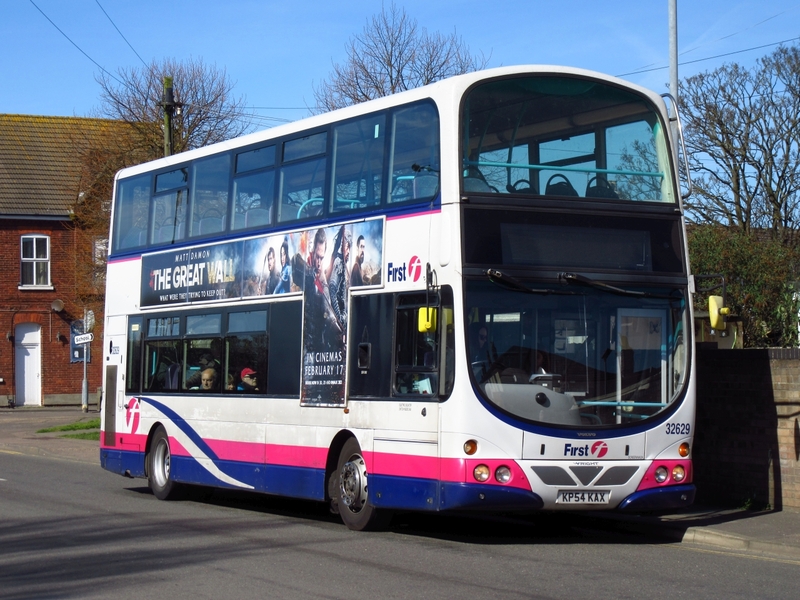 RSL766 is a Volvo B12B with Van Hool bodywork. I looked up the registration and a little confusion reigns over its true identity. Many photos of RSL766 are online but carrying fleet number 33 (ex YJ06GLZ/RS06RSL), this vehicle is 37 which suggests a recent re registration, 37 was SL09RSL new as YJ09FHS. Any confirmation would always be welcome! I took advantage of the spring sunshine to grab a few shots around my old haunts of newtown this morning and managed to capture a some of the Gemini fleet of Yarmouth in action in the bright conditions. A few decent shots captured, hopefully the weather will continue in this vain so a few more trips can be planned! Today's Notices and Proceedings Report, by the East of England Traffic Commissioner, shows the introduction of a new service, an alteration of another and a cancellation. First Eastern Counties is to introduce a new Sycamore Drive, Rendlesham to Farlingaye High School service from 18th April 2017. Numbered 917, it will operate on Monday to Fridays on school days only. 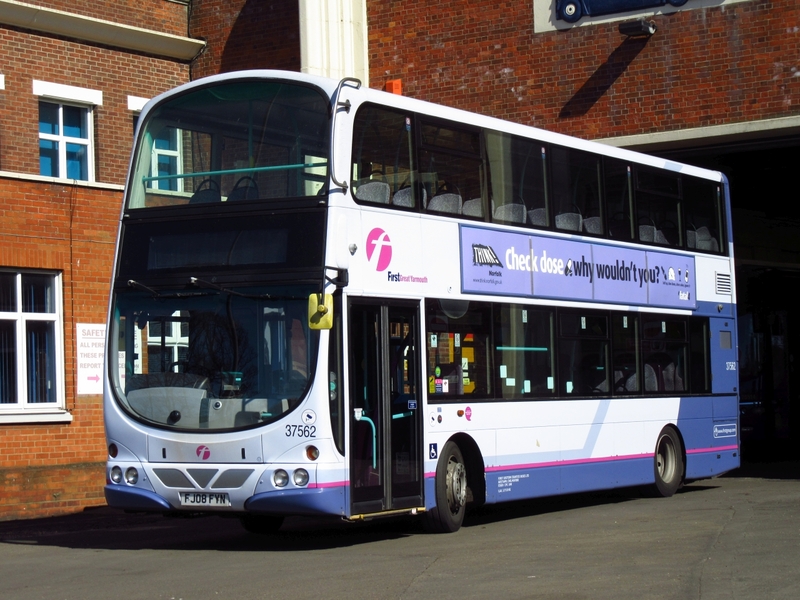 Venturer Coachways is to cancel its 937 Woodbridge schools service to Felixstowe under short notice from the 31st March 2017. Driver Roger Bellward had one of his rare Sundays at work and captured some visitors to First Great Yarmouth's Caister Road. A local resident of our area was very privileged in being invited to attend the recent 85th anniversary celebrations of London's Victoria Coach Station. Martyn Jarvis of Lowestoft could only attend on Friday last due to other commitments over the weekend so here is is his take on the day. 'The event took up lanes 1-4 of the coach station being protected by Heras fencing on red/white blockers. There were photo opportunities to be had viewing the entrance for those want shots of modern coaches entering the coach station. Inside the parking area, coaches were parked in close fashion as they would be in a ‘real’ situation. Not so good for photography but recreating an ambience of coach travel of the 1950’s & 1960’s. On the Friday there was a good representative collection of Bristols, Leylands, AEC, Bedford SB and BMMO C5. Entry was not permitted except by invitation but a wonderfully supported event. A 1932 English Electric bodied AEC Regal - FV4548 is currently available for sale. Organised by the ‘Thames Valley & Great Western Omnibus Trust’ who had a stall inside the main concourse. They were selling various memorabilia including a commemorative booklet for a very reasonable £6. This was well illustrated showing the coach station history throughout its existence from 1932 to 2017. How many facilities in the UK can equal this record? Interestingly there is a photo of the underground coach park (which I didn’t know existed) but with numerous concrete support columns did not suit 36ft coaches of the latter 1960’s. Of local interest a photo of HAH892D loading for the East Anglian Express service to Yarmouth via Chelmsford & Bury St Edmunds. Other stalls present included one crewed by TfL/VCS staff who were giving away a souvenir programme showing the various coaches expected to be present over the three days. Colour photos and a brief description of each vehicle including present owner are included. For a small donation to the ‘Transport Benevolent Fund’ it was good value. Bachmann also had their roadshow stand and were selling some 2nd grade model buses at giveaway prices. Their display stand showed both 2017 model programme buses in 1:76 scale and some 1:148 ‘N’ gauge buses. One thing caught my eye and that was the manufacturers sticker in the back window of OAX9F – namely for BCV and ECW. Very topical with this being the 30th anniversary of the ECW plant closure, very sad. Many thanks to Martyn for his contribution and his photos - it looks to have been a very enjoyable day. 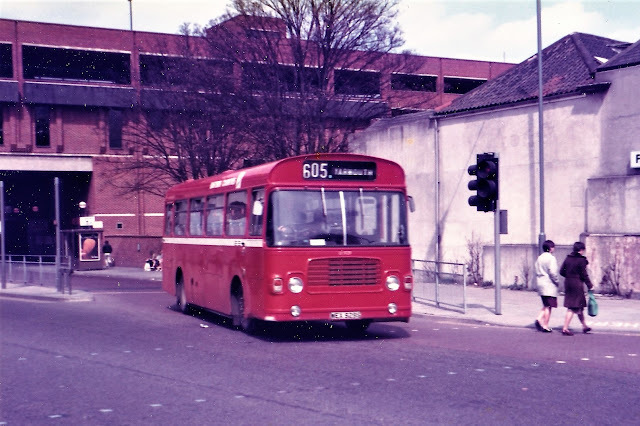 The subject is WEB409T, an AEC Reliance with Plaxton Supreme IV Express C49F bodywork which was new to the operator in February 1979. 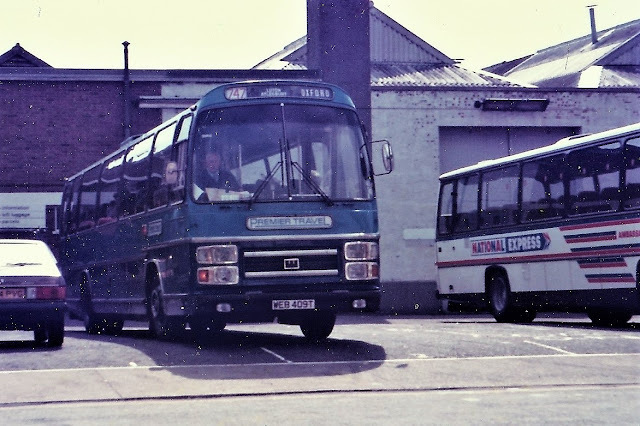 It was exhibited at Showbus 80 and became the only Reliance and oldest vehicle to join the fleet of Cambridge Coach Services from Premier Travel. 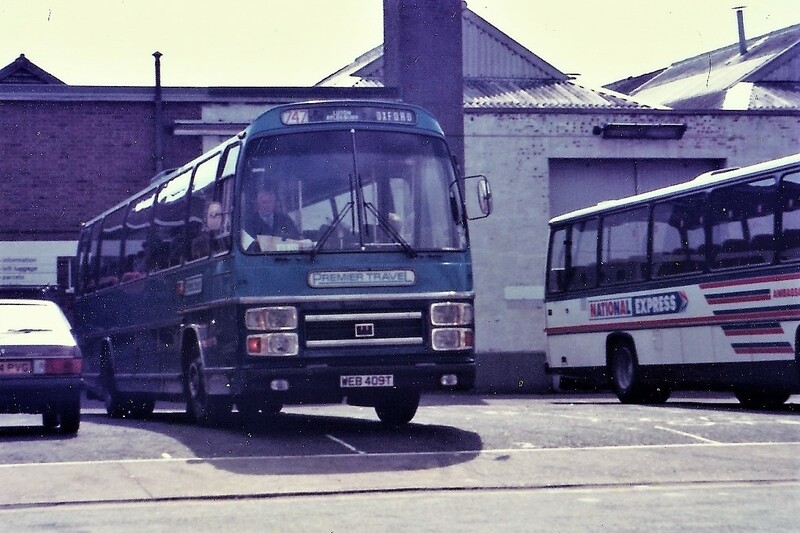 After a short stay with Cambridge Coach Services it moved on to Davids of Pontcymer, South Wales, in 1994. Note the Ambassador Travel coach to the right. 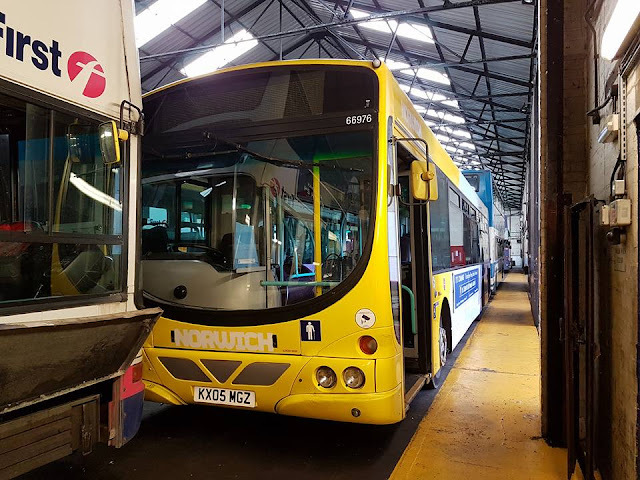 You may remember yesterday I stated that one of Norwich's StreetLites was on loan to Great Yarmouth's Caister Road depot. 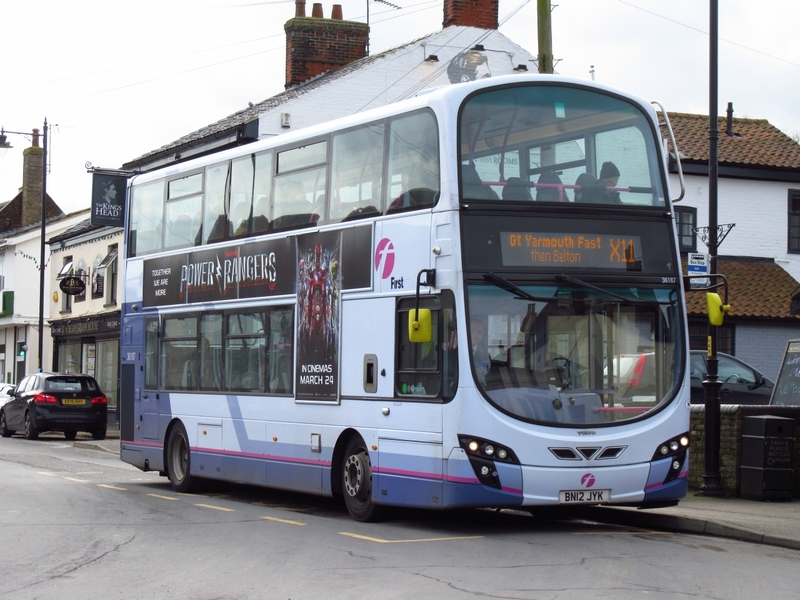 Today 47511 SN64CRX spent most of the day on the 6 route between Bradwell and Market Gates Bus Station and I photographed it leaving the latter terminus earlier this afternoon. 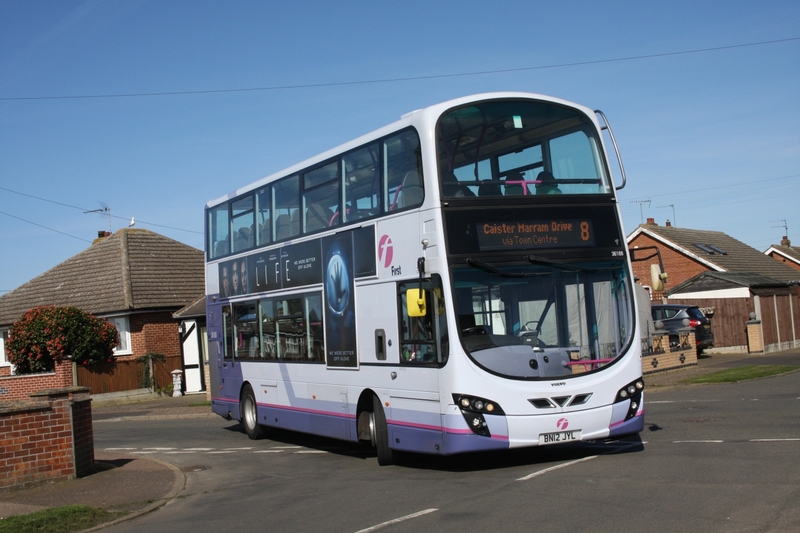 Firstly, and ironically, a Konectbus visited the Great Yarmouth and Lowestoft area on Anglian's 61 route between Kessingland and Great Yarmouth's Barrack Estate. I say ironically as the operator pulled out of providing bus services in Great Yarmouth only on Saturday! 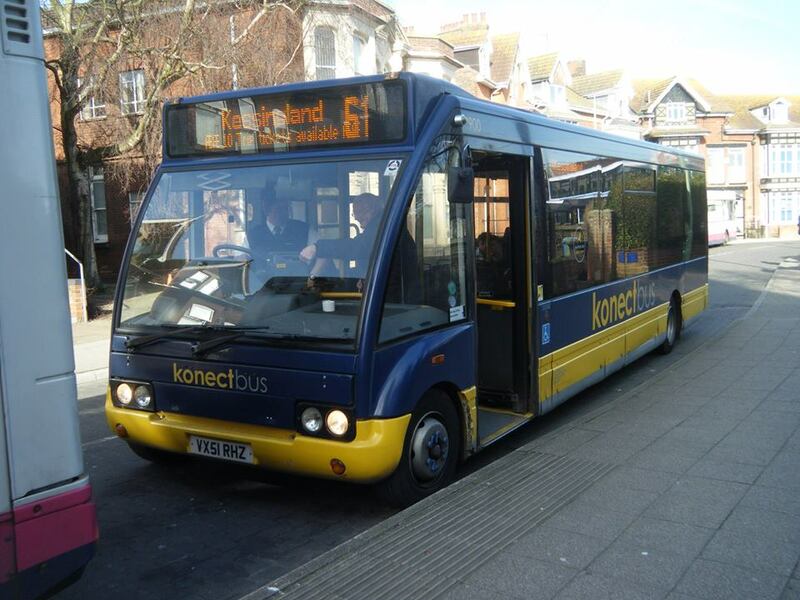 Simon managed to get a photo of Konectbus 900 VX51RHZ at Gordon Road next to Lowestoft bus station yesterday. During a sunny Sunday afternoon, I wandered along Great Yarmouth seafront and found two Setras parked together outside the SeaLife Centre on Marine Parade. At the front was Shearings Holidays 313 BK11COJ with National Holidays NH14KBH bringing up the rear. Today was the last day for the Konectbus 7 service between Great Yarmouth and Norwich. 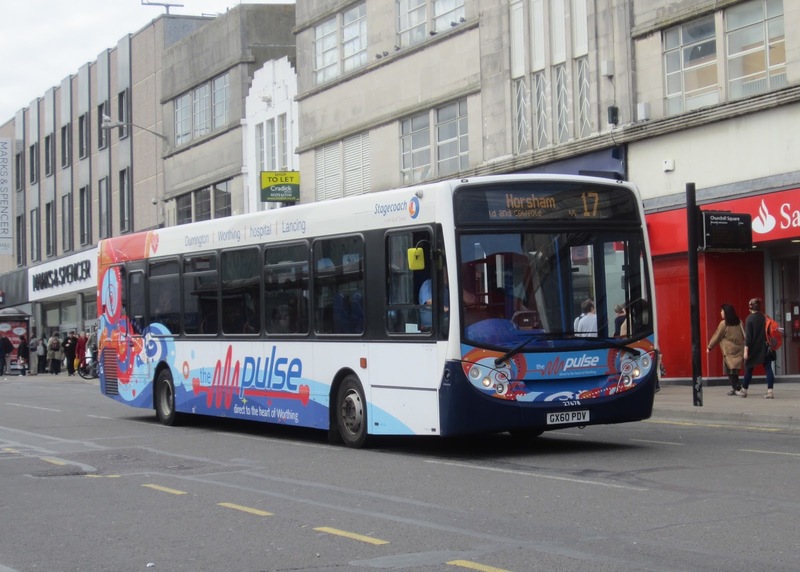 It began in late July last year as replacement for the Anglianbus 7 with the timetable being revised only some three months later. 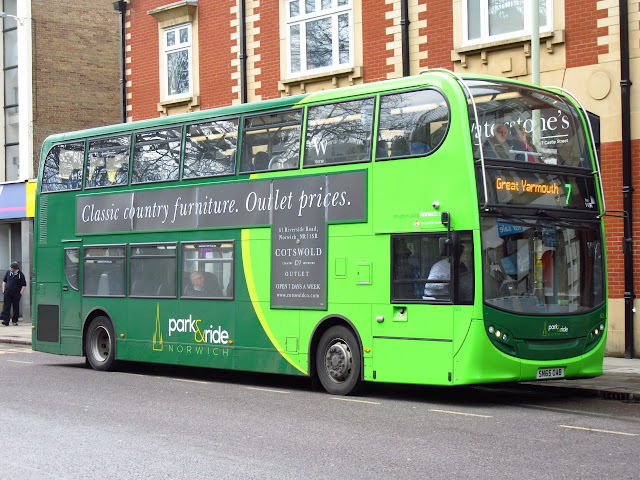 So a visit to Great Yarmouth town centre was in order to record some of the last day of workings of the especially adapted green fronted Park & Ride liveried ADL Enviro400 bodied Dennis Tridents. 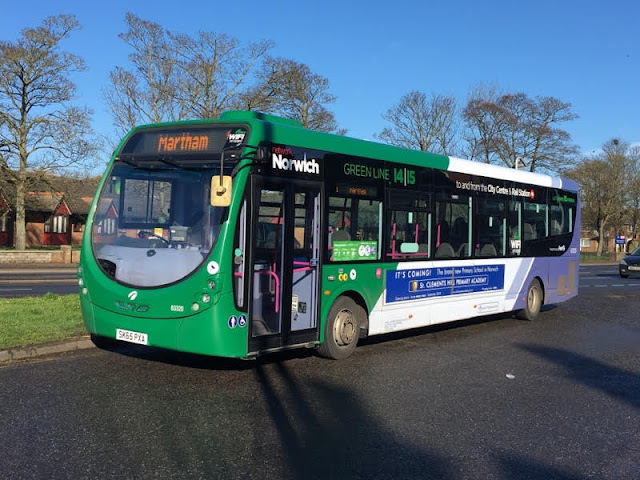 However, all did not go to plan as the 13:05 arrival in Market Gates from Norwich Bus Station didn't have any green on it at all! 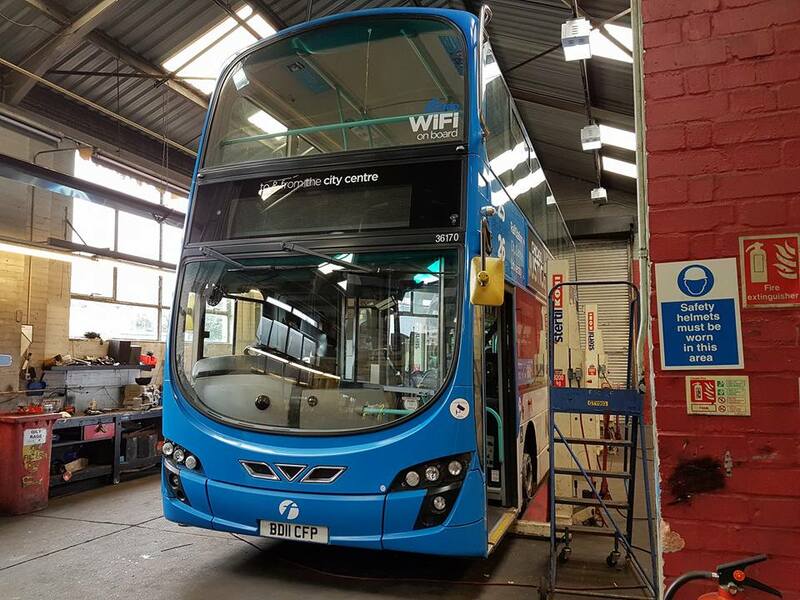 In fact it was worked by Konectbus blue and yellow liveried 602 SN10CFF! 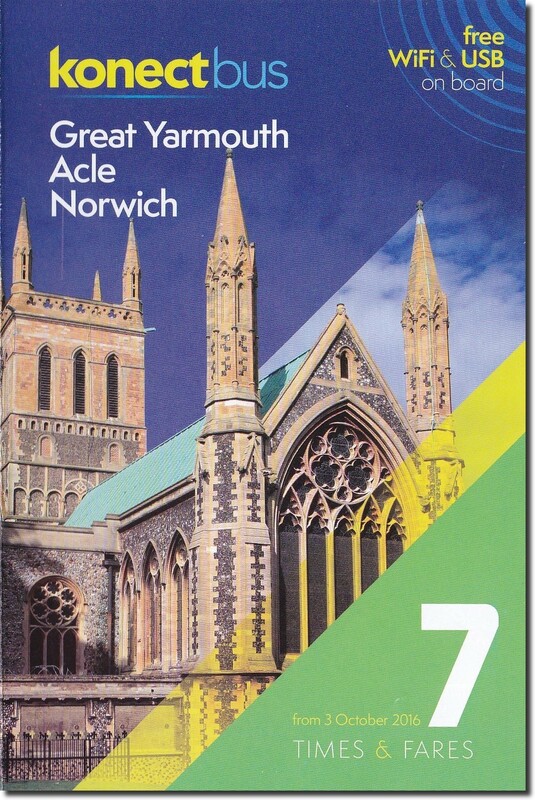 The cessation of the Konectbus 7 services means that First now has the Norwich to Great Yarmouth corridor to itself. 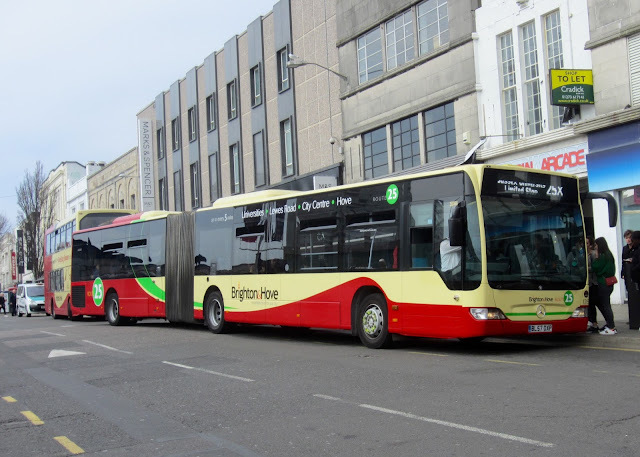 Last month I reported that First Great Yarmouth's two non DDA compliant Volvo B7TL / Alexander ALX400s 30887 and 30902 (W742/757DWX) had been withdrawn and sold to a dealer in the North West of England. 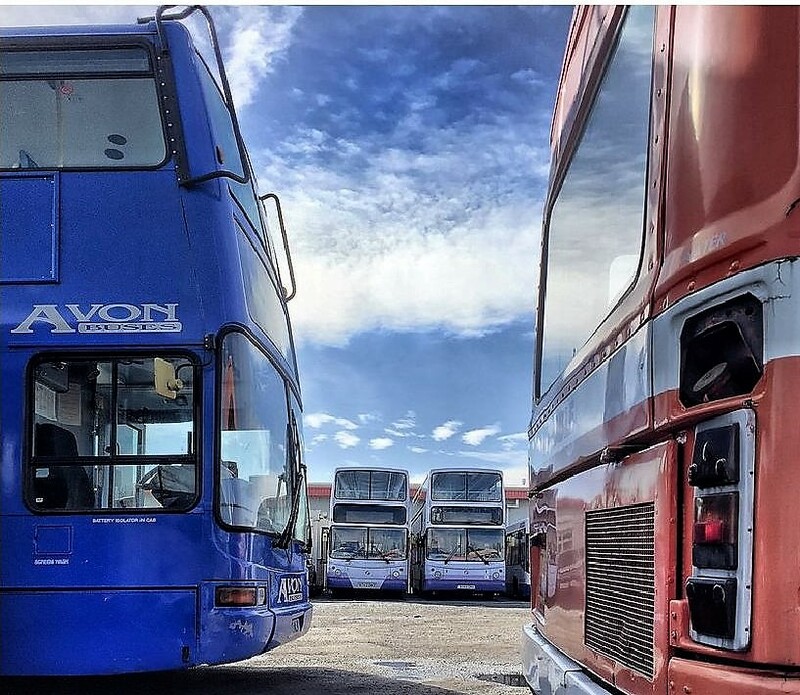 They have quickly found a new owner with the twosome being acquired by Avon Buses of Prenton, Birkenhead which operates services in Merseyside and Cheshire. Regular blog readers will know that I reported last month that First Great Yarmouth's Volvo B12M / Plaxton Paragon coach 20500 AO02RBX was soon to be on its way to the North West of England following its sale to a dealer from the Liverpool area. Mindful that 2017 sees the 30th anniversary since the closure of the works on Eastern Way, I thought this 5th June 1985 photo of two Leyland Olympians 'straight out of the box', so to speak, would be quite appropriate. Nearest the camera is Crossville's B197DTU which has yet to receive its DOG197 fleet number. It went on to receive Midland Red and Arriva liveries prior to going to Eagles & Crawford of Gwernymynydd. It was subsequently acquired by P & O Lloyd of Bagillt in August 2005 and then moved on to Alpine Travel in February 2009. The June 2015 issue of Buses magazine reported Alpine had sold it to a dealer. Behind is United's 254 B254RAJ which later became East Yorkshire's 542. However, it didn't last as long as B197DTU as it was written off following an accident in April 2002; being scrapped a month later. The Martham - Lowestoft 1 service has an unusual working to report this morning, a message from Will Drake to say that Norwich Green Line liveried Streetlite 63320 SK65PXA was in use on the service this morning. It is pictured outside Caister Road about to start its duty. Seen here later in the day by myself in Ormesby St Margaret about to stop outside the Royal Oak. Thanks to Will for the message and Photograph. The lovely mild sunny morning greeting us here on the east coast encouraged me to continue my regular school/college run to Great Yarmouth seafront. 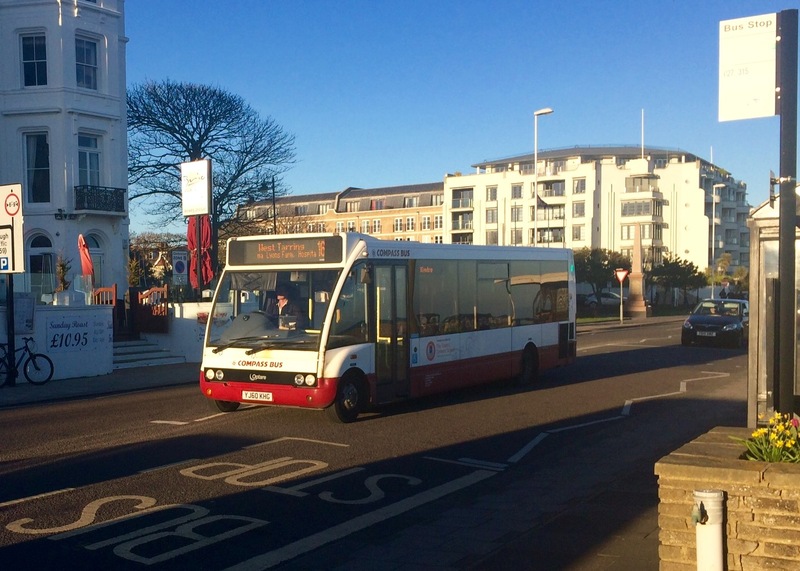 On the opposite side of Marine Parade (above) was a 16 plated Mercedes Benz Tourismo basking in the sunshine. Shearings Holidays 839 BJ16KXM was painted in the latest version of the Grand Tourer livery. Been a while since i had the camera out in Norwich so i ventured up to the city yesterday to catch up with the goings on. It was my first visit since all the Red line Geminis had been painted so i managed to grab a selection of them in use, 36191 BN12JYR is seen here in Theatre Street heading out towards Thorpe on the 24A. Sanders recently aquired some Volvo B7RLE's from GHA Coaches in Wales, DK09DZH is pictured above heading to Stalham on the 10 service. Konectbus will shortly be finishing the 7/X7 services to Great Yarmouth so a few shots were grabbed for historical purposes so to speak! 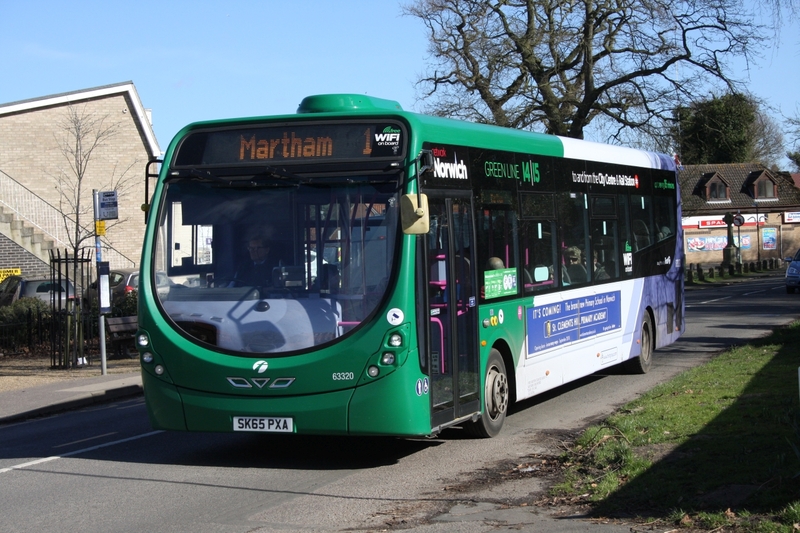 Normal liveried Enviro SN65OAB seen here in Castle Meadow working the 7 service. Finally my first taste of an ex Leeds Gemini for my trip back to Acle, 36187 BN12JYK was on X11 duties to Belton, seen here at The Kings Head in the village.